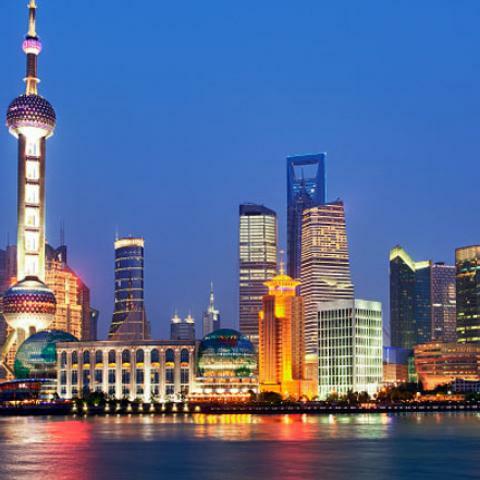 As the world’s most populous city, Shanghai is a thriving metropolis with a strong global influence. Described by The New York Times as “Beijing’s naughty sister”, China’s financial capital is an exciting and impressive cosmopolitan city, typified by neon lights, a bustling cityscape and one of the world’s most recognisable skylines. A popular tourist destination, Shanghai is a “showpiece” of China’s economy and is renowned for historical landmarks such as The Bund, City God Temple and Yuyuan Garden, and for its status as the centre of commerce between the east and the west. Unlike most major Chinese cities and blocs, Shanghai isn’t overly well known for its local culinary traditions. Instead the world’s most populous city blends appealing aspects of national and regional food styles to create a melting pot of Asian, western and religious fares, which feature on menus throughout the city’s popular dining precincts. The Bund is Shanghai’s signature promenade – a cosmopolitan waterfront hub of restaurants and bars that comes alive at night with visitors and locals and the reflections of Pudong’s lit-up skyline. Rooftop or alfresco dining overlooking the city’s most famous street is an experience not to be missed... Indulge in new western cuisine on the open-air balcony of M on the Bund, or enjoy a romantic dinner at The Cupola atop Three on the Bund. A hotbed for the glamorous and trendy, the Bund is also a popular nightspot for mingling expats – Bar Rouge’s Sky Lounge, Zeal at South Bund 22, M1NT and Shelter are among the area’s favourite meeting places. Considered one of China’s first lifestyle centres, The Xintiandi district also typifies Shanghai’s cosmopolitan nature. Located in the centre of Shanghai City, the precinct is divided into two parts: the South Block and the North Block. The South Block hosts restaurants, cafes and bars from all over the world; while the North Block is lined with antique Shikumen buildings, which house upscale stores and international restaurants. 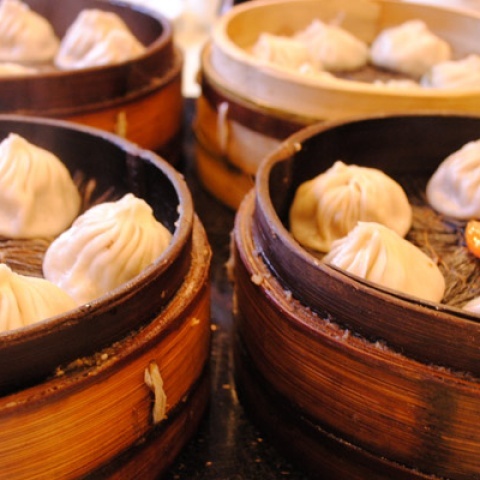 Serving snack foods like dumplings, noddles, steamed buns and vegetable dishes Taiwanese chain, Din Tai Fung is one of the area’s most renowned eateries – a favourite haunt for Chinese celebrities and locals. Pudong on the eastern side of the Huangpu River is the city’s newest and most recognisable district – hosting Shanghai’s famous skyline. As China's financial and commercial hub, the area is populated by a number of business towers, which house world-class restaurants and bars. The Oriental Pearl Tower, the skyscraper atop the 101-story Shanghai World Financial Center, features a 91st floor revolving restaurant, which showcases panoramic views of Shanghai. The Shangri-La Tower’s impressive array of restaurants also display stunning views, particularly Jade on 36 – a modern and stylish space that looks out over the historic Bund. While Shanghai prides itself in its multicultural and modern dining scene, local specialities can still be found throughout the city. Fronting the East China Sea, seafood is very popular in Shanghai. The most notable local delicacy is Shanghai hairy crab (Chinese mitten crab). Seasonal to winter, the crabs are tied with strings, placed in bamboo containers, steamed and served. Some of Shanghai’s most notable hairy crab restaurants include: Ling Long Ge near Yan’an Xi Lu, Cheng Long Xiefu near Jiangxi Zhong Lu, and Wang Bao He west of Zhejiang Zhong Lu. Shanghai is a shopper’s paradise. Shopping streets sprawl over neighbourhoods, mega complexes reach skyward, while some of the city’s most historic centres have been refurbished to accommodate trendy retail precincts. Shanghai’s shopping areas are distinctively divided into "Four Streets and Four Cities". The “Four Streets” consist of Nanjing Road, Huaihai Road, North Sichuan Road and Middle Tibet Road. Huaihai Road is celebrated for its elegance, showcasing top-end international designer brands such as Gucci, Ferragamo, Hugo Boss, Bally and Kenzo. North Sichuan Road is a bargain hunter’s go-to, offering inexpensive titbits. Middle Tibet Road caters for the Shanghai’s food and tourism shopping needs. While Nanjing Road is one of the world’s busiest streets, and most famous of the four streets – a six kilometres long stretch, divided into two sections: east and west. East Nanjing Road in central Bund is a dedicated commercial zone, featuring a pedestrian mall that hosts Shanghai’s oldest department stores, a variety of national retail outlets, and big name western luxury brands. West Nanjing Road begins at People's Park and offers upmarket malls, office buildings and five-star hotels. Yuyuan Shopping City, Xujiahui Shopping City, New Shanghai Shopping City and Jiali Sleepless City make up Shanghai’s lively "Four Cities". Yuyuan Shopping City specialises in Chinese goods, particularly arts and craft, precious stones and metals and jewellery. Shopping and entertainment plaza, Xujiahui Shopping City sells upmarket and mid-range priced goods. New Shanghai Shopping City is grand and opulent, offering first class facilities and amenities in the middle of Pudong’s finance and trade zone. While Jiali Sleepless City is a great destination for souvenir shopping, with large and small shops selling handicrafts and bric-a-brac. For a taste of Shanghai’s old culture and tradition, Fuzhou Road is a must-visit. Named "Culture Street" more than a century ago, the road is famous for outlets that deal in cultural items, such as Chinese books, music and art. In recent times it has also grown a reputation for supporting local fashion. Working in her dream job travelling the world filming food and travel show A Taste of Travel, celebrity chef Alana Lowes shares her top 5 dishes you must feast on in China. Huangpu River splits the city of Shanghai in two – one’s old and the other spanking new. Here’s how you can discover both sides of the story.